Eating fruit like that plays a major role in detoxifying your system, supplying you with a great deal of energy for weight loss and other life activities..
Let’s say you eat two slices of bread, then a slice of fruit. The slice of fruit is ready to go straight through the stomach into the intestines, but it’s prevented from doing so. In the meantime, the whole meal rots and ferments, and turns to acid. The minute the fruit comes into contact with the food in the stomach, and digestive juices, the entire mass of food begins to spoil. 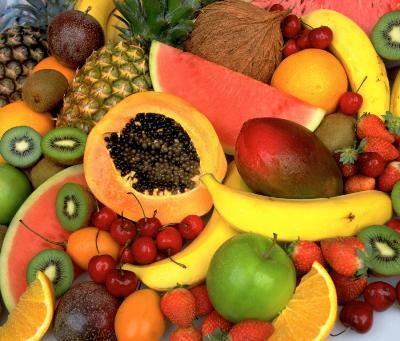 Eat your fruit on an empty stomach, or before your meal! You’ve heard people complain: Every time I eat watermelon I burp, when I eat durian my stomach bloats, when I eat a banana I feel like running to the toilet, etc. This will not happen if you eat the fruit on an empty stomach. Fruit mixes with the putrefying other food and produces gas. Hence, you bloat! Graying hair, balding, nervous outburst, and dark circles under the eyes – all of these will NOT happen if you eat fruit on an empty stomach. Asala Alaykum sis Karimah. Jazaki’Allah Kheyran for such an excellent advice!!! Does the same go for fruit juice consumed after a meal? do not drink juice after a meal if you can help it, the fruit juice which digest quickly cause the protein and carbohydrates to ferment in the stomach, with the exception of figs that makes bread not ferment in stomach…but hey who drink fig juice these days?